To book online, click on the Reserve A Seat button above or use the Reservation Form below. Round trip transportation on chartered school bus. Two hours of snow tubing at Chicopee Tubing Park in Kitchener. 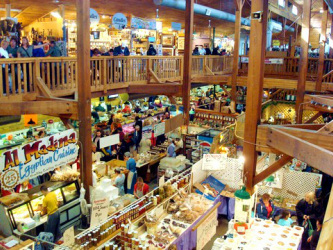 Visit to the St. Jacob's Markets for shopping, dining, antiques, bargain outlets and whatever else you can find at St. Jacob's. And oh yeah, don't forget to try their fabulous apple fritters! Tour & tasting of 5 craft beers at Grand River Brewing Company. A free souvenir Grand River Brewing Company beer glass for every passenger. Visit to Boston Pizza for dinner. **Note** Cost of dinner is not included in the day trip, each person will pay for their own food and drink. Please order as much or as little as you wish. $78 per person all taxes and tips included. We have a very full and exciting day planned for you to take away these winter blahs! Our day begins when we board the bus at approximately 9:30 AM and we return to the Toronto area at approximately 10:00 PM. Now that's a full day! We start off our day by visiting the markets at St. Jacob's. 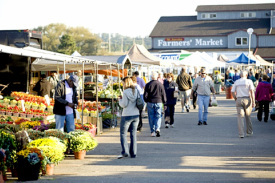 This is the perfect opportunity to stock up on locally produced meats, cheeses and produce. And of course shop for all kinds of collectables, antiques and anything else that catches your eye. Grand River Brewing Company is a small craft brewery located in Cambridge. It's committed to producing fresh craft brewed beers of outstanding quality for discerning beer drinkers. Here's your opportunity to go behind the scenes of a craft beer making facility and see how it works and how craft beer is made. We get a private tour of the brewery and then we get to sample 5 of their craft beers. And as a gift, everyone gets a GRBC glass to take home with them. After our shopping and beer touring experience, we board the bus to go for 2 hours of fun and screaming excitement doing snow tubing at the Chicopee Snow Tubing Park. 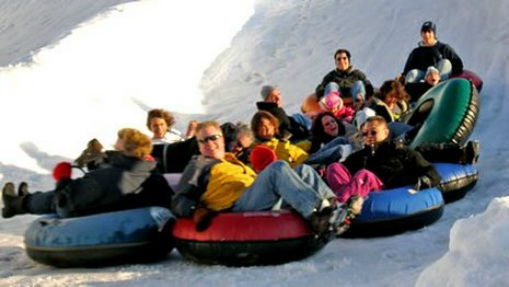 Now let me tell you, if you have never been snow tubing, you are going to have a riot. You are given a big inflatable rubber tube and then you are pulled to the top of the hill where you sit down in your tube and come sliding down the hill. You can tube down by yourself or, for more fun, we can hold on to the tubes of other people next to us as we tube down together. Please note, you do not have to climb the hill after every tubing run! An incline escalator will be in operation to take you back to the top. Tubing requires no special level of fitness or any advanced expertise -- it's the easiest thing in the world and almost anyone can do it. It does however require you to sit down and stand up and if you can do that, you can do tubing. Oh there will be thrills, chills and screaming for sure... but it's all good fun. And after you get to the bottom of the hill, well, you get up and go back up the hill and do it all over again.... and again.... and again! After our snow tubing session, we change back into our street clothes and board the bus and visit a local Boston Pizza restaurant where we will be having our dinner while we mix and mingle with our fellow tubers and swap stories on how we experienced mortal danger in our downhill runs! **NOTE** The cost of your dinner is not included in the tour price. The restaurant has agreed to allow our group to order from the regular menu and provide us with individual bills. So please feel free to order as much or as little as you wish. And then, after having spent an entire day shopping, eating, laughing, tubing and screaming, we finally come home, exhausted but having loved every minute of it. The most often asked question from passengers on this trip -- "When are we going again?". Trafalgar Rd & Hwy 401, Milton. We leave at approximately 9:30 AM. Actual pickup times vary by stop and will be sent out in the final email to all registered attendees, 2 days before the trip. We return to Toronto at approximately 10:00 PM. Children 10 and older are welcome on this trip.